The developed area of Flagstaff is bordered in the southwest by interstate 40, as beyond this the land is thickly wooded, with scattered residences, plus a golf club and the local airport. This part of the city is dominated by the campus of Northern Arizona University, which is surrounded by numerous shops, bars and other facilities. There are many hotels hereabouts, all less than half a mile from the I-17/I-40 intersection, and within walking distance of all necessary services. The historic city center is another mile north, on the far side of the railway. One more unusual attraction nearby (5 miles) is the Arboretum at Flagstaff, which showcases a varied collection of the plants native to this mountainous area of the state. 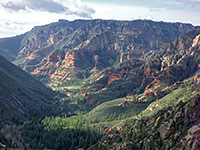 Many people opt to stay in Flagstaff when visiting Sedona as the lodging is cheaper; the famous Oak Creek Canyon begins just 12 miles south, along Hwy 89. One of two Marriott properties to be built in Flagstaff in 2009, the Courtyard is now the closest hotel to the I-17/I-40 intersection, situated on a small hill along Beulah Boulevard, a short walk from Wal-Mart and several other large stores. Decor is bright and elegant, and the hotel has a range of modern facilities including a large touch-screen information board in the lobby, a suite of guest-use computers in the business center, and private media booths with personal TV and internet/charger connections. The 164 room/suite Courtyard also provides a restaurant (serving breakfast, lunch & dinner), fitness center, hot tub, laundry, and various facilities for business/meetings/events. Two miles south of downtown Flagstaff, the Hilton Garden Inn welcomes guests to a cozy-looking three floor building shielded from the surrounding roads by a line of trees, and backing on to a quiet side-street. A free shuttle is operated to Flagstaff Airport, 4 miles south. The hotel has two dining outlets on-site, Great American Grill providing freshly-cooked breakfast, and Coco's Bakery (adjacent), which serves lunch & dinner. Snacks and drinks can be purchased 24 hours a day from the Pavilion Pantry convenience store; these include meals cookable using the microwaves installed in every guest room. Leisure facilities are the usual pool (indoor), hot tub, fitness center and sauna. The more central of the two Hampton Inn hotels in Flagstaff is part of a group of shops, restaurants, businesses and other lodging around the north end of I-17, at the I-40 intersection. The 129 rooms & suites face north or south; some have distant views of the San Francisco Peaks. Apart from the good sized parking lot, all facilities are indoor; these include an indoor pool/hot tub, a fitness center, 24 hour business center and two meeting rooms. Hot breakfast is complimentary (take-out version available, Mon-Fri), as is wi-fi. Open summer 2009, the new SpringHill Suites by Marriott hotel in Flagstaff (formerly AmeriSuites) occupies a substantial, five floor building on Beulah Boulevard, one block from the I-40/I-17 intersection on the south side of town, and within a short walk of various restaurants and large stores. There are 112 suites available, all in a studio configuration (equipped with a microwave, sink & refrigerator), plus a fitness center, business center, guest laundry and meeting space. Free hot buffet breakfast is prepared each morning, and an on-site convenience store sells drinks & snacks 24 hours a day. Comfort Inn Flagstaff has a relatively quiet location away from the railway, a mile southeast of downtown Flagstaff and 2 blocks from the I-40/I-17 intersection. The 85 rooms & suites are on 3 floors, some overlooking the hotel's outdoor pool/hot tub, others having more distant views northwards to the often snow-capped San Francisco Peaks, and all benefiting from floor-to-ceiling windows. The mini suites have additional amenities like a microwave, refrigerator and extra storage. Within walking distance south along Beulah Boulevard are a selection of restaurants, bars, and various shops including Wal-Mart. Free continental breakfast is served. One of two Quality Inn hotels in Flagstaff, this is situated close to the Northern Arizona University precinct, along Milton Road, in a residential area less than half a mile north of the junction of interstates 17 & 40, surrounded by patches of pine woodland and close to the edge of the Coconino National Forest. Many of the 96 rooms have nice views across town towards distant mountains; all are clean, if a little on the small side. Hotel amenities include an outdoor pool, newsstand and free continental breakfast (including a few hot items); for other meals there are several nearby restaurants, closest being Denny's right next door. The Sleep Inn of Flagstaff provides 58 comfortable, clean and welcoming rooms at economical rates. Standard rooms have a coffee maker & ironing facilities; also available are mini suites featuring a microwave, refrigerator and extra sofa bed. The interior corridor hotel is relatively new, and is located on the south side of town adjacent to the I-17/I-40 intersection, part of a shopping complex that contains various restaurants and stores including a Wal-Mart - over a mile from the railway tracks, noise from which can affect some properties in the downtown area. Inside the building are a pool, hot tub and dining area for the free continental breakfast. Near the south edge of Flagstaff, the Baymont Inn is a well maintained, good value, three floor hotel, with 131 rooms - on the small side, but clean and most are equipped with a microwave and refrigerator. It offers some of the closest lodging to the Northern Arizona University (NAU) - half a mile away along Milton Road. Access is easy as the I-17/I-40 junction is just two blocks south, as is a large shopping center and a selection of restaurants. The inn has tree-lined grounds with an outdoor heated pool & hot tub at the rear, and a fitness center inside. Free deluxe continental breakfast is offered - including a few hot items. Budget-priced Days Inn Flagstaff I-40 has a modern, interior corridor design, and a convenient location near the I-40/I-17 intersection - towards the west edge of the city adjoining the Woodlands Village shopping district, which includes Wal-Mart and many fast food restaurants. Complimentary amenities at the two story motel are wi-fi, continental breakfast and a weekday newspaper, while also available are a business center and guest laundry. Motel 6 Flagstaff West occupies a U-shaped, three floor, exterior corridor building with an outdoor pool at the center, shielded by large shady trees from I-40 which runs past immediately south. In the other direction, on the far side of the street, is the Woodlands Village shopping center which includes Wal-Mart, a supermarket and a good selection of restaurants. Besides the pool, the only amenities are free coffee, guest laundry and wi-fi. This location is 2.4 miles from downtown Flagstaff and half a mile from Northern Arizona University (NAU).